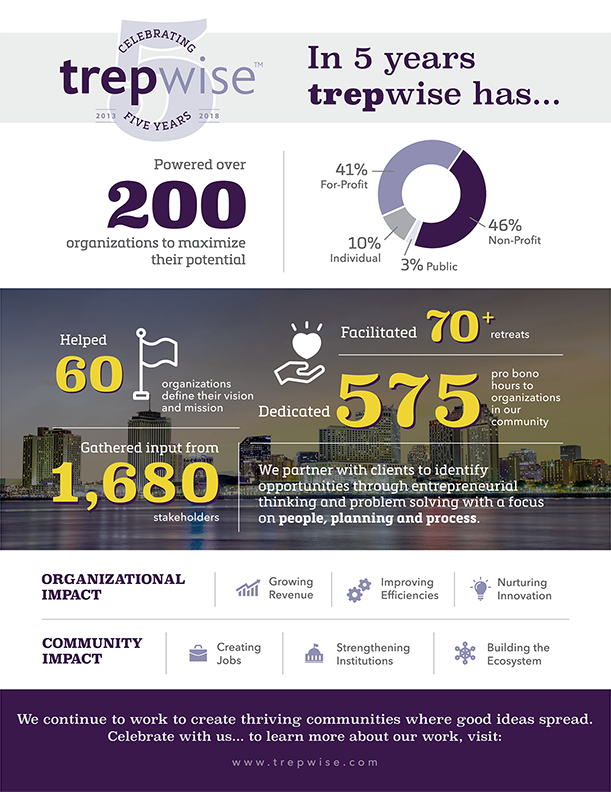 New Orleans (November 26, 2018) – trepwise, a local growth consulting firm, is celebrating its fifth anniversary, demonstrating the demand for these services in the community and the impact the team continues to create through their work. Over the last five years, trepwise has powered more than 200 organizations to maximize their potential: 46 percent of whom are non-profit organizations, 41 percent for-profit, 10 percent individual coaching clients and three percent from the public sector. In its five years, the firm has grown to a robust team of 12 employees who have helped 60 organizations define their mission and vision, have facilitated more than 70 retreats and gathered input from more than 1,680 stakeholders. To-date, trepwise has dedicated 575 pro bono hours (and counting) to organizations in our community. The team has worked alongside clients to meet them where they are and use entrepreneurial thinking to problem solve, with a focus on people, planning and process. Founded in 2013, trepwise is a growth consulting firm that powers organizations to maximize their potential. The firm partners with clients to identify challenges and opportunities through entrepreneurial thinking and problem solving with a focus on people, planning and process. Working with hundreds of organizations across all sectors and industries, its team leverages innovative approaches to create sustained competitive advantage and impact for clients. The firm extracts insights, designs strategies, and supports implementation to set clients on a pathway to organizational excellence. trepwise believes that every organization can benefit from this approach, which it calls entrepreneurial thinking. Located in Central City on Oretha Castle Haley Boulevard, trepwise’s envisions thriving communities where good ideas spread. Whether it is strengthening institutions that provide essential services to individuals and families, helping to build a robust economy with organizations that are hiring and paying well, or creating opportunities for individuals to access prosperity through starting and growing organizations – it all starts with good ideas. Connect with trepwise on Facebook or follow on Twitter (@trepwise) and LinkedIn. For more information, visit: www.trepwise.com.